Growing pains are the hallmark of any small business, and the term in itself is indicative of that. If you have high demand for your product, you need to hire. If you outgrow your cooler space, you have to obtain a second one. If you’re hoping to produce, oh let’s say 25,000 barrels of beer someday, you’ll need to find a beer distributor to do some of the heavy lifting for you. Growth is good. Pain can be alleviated. Read how Insight Brewing Company of Minneapolis just blew out its first birthday candle, and how Bernick’s helped them celebrate. I always like to ask the folks at breweries why beer? Because most of the time, they say it has everything to do with passion. Insight Brewing Company is no different; they just have a more global view on the beer they pour in the Land of 10,000 Lakes. Insight’s Brewmaster Ilan Klages-Mundt traveled the world in college, and apprenticed and volunteered at a few different breweries. He exchanged his work ethic for a place to sleep in many instances, and gained unrivaled beer knowledge and exposure at Fuller’s in England, Kiuchi in Japan, and Fanø and Søgaards Bryghus in Denmark. Then, it was time to come home. On Insight’s website they list their beers with a nod to the country that inspired the brew. Their Devil’s Companion is a London-style porter; The Garden of Hell Chicken is a pale ale with yuzu fruit – indigenous to Japan. Insight’s entire portfolio tells the stories of Ilan’s travel and foreign beer tales and elevates the brewery as one who’s doing something different. And doing something different in craft beer in Minnesota is important; there are 111 breweries expected to be open by the end of the year. As for the genesis of Insight, Ilan met fellow co-owner Brian Berge, who has a background in consumer packaged goods marketing, at a northern brewer class. Kevin Hillard was a college acquaintance of Brian’s, and the two discussed the similar parallels they had starting at a new point in life, and both making beer on the side. Kevin took over the sales portion of Insight after investing in the start up. Fourth co-owner Eric Schmidt joined the roster a few months later initially as an investor with a propensity for logistics and operations. 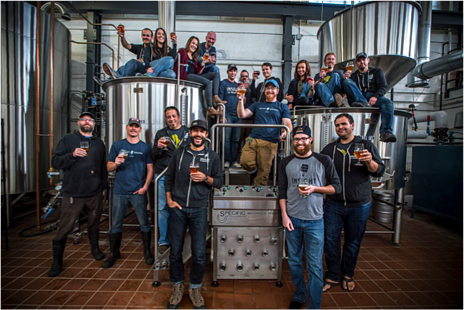 The four comprise Insight’s leadership team, and opened the largest start-up brewery in the state one year ago. Their 19,300-square foot facility sits just off Highway 280 on East Hennepin in Minneapolis. Originally a boiler manufacturer, the building had sat vacant for eight years prior to Insight’s takeover. The last operation of the building was under Warren Shade, a company that produced window blinds. 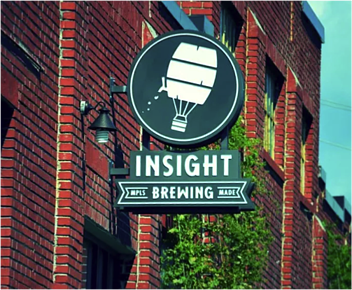 The guys at Insight chose the building’s location with a purpose – to utilize Minneapolis water due to its low mineral content and to find a building zoned for brewing and close to residential neighborhoods. They also chose the size of the building with intent, knowing their goals for growth and expansion could be met in the original facility’s blueprints. They didn’t want to face being hindered by capacity. Start small mentality. Insight’s size should allow them to produce up to 40,000 bbls (barrels) annually. For scope, Insight expects to produce 3,000 bbls this year. Kevin manages a sales team of three Insight employees, plus three brand ambassadors. The big days for sales are Mondays and Tuesdays, where the team is pulling doors, stopping in on accounts, and ensuring Insight beer is everywhere it’s supposed to be. The main goal of this operation is to remain top-of-mind when it comes to craft beer awareness, and to ensure all 220 of Insight’s accounts are well serviced, well stocked, and well loved. Insight spent until June 2015 self-distributing its product all over the state of Minnesota, with presence in Minneapolis/St. Paul, St. Cloud, Rochester, Brainerd, Bemidji, and Duluth. Kevin recalls the effort it took to amass those 220 accounts in their service portfolio as “Herculean” considering it was a small contingency doing the work.